The speaker jack and fuse (1A) are located under chassis. Fender switched back to the blackface era cosmetics in 1982. Champs produced in 1982 have a black control panel and silver sparkle grill cloth. 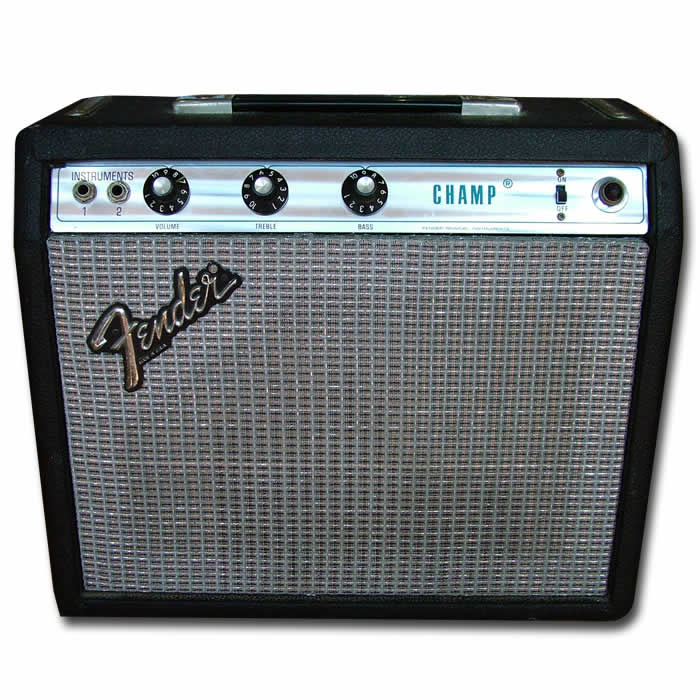 Pingback: Fender Champ INPUT power? - GeekChat! Just got one of these. Great amp! I don’t like having tons of knobs to tinker with, and with the Champ I just find a basic setting and let my playing do the rest. I’ve been able to record into the night with this as well. So glad I found it! Just picked up a “drip edge” 68 Champ, paid $350 cnd, so it looks like I paid a fair price…..
That’s a good price for an original drip edge Champ. IMHO the drip edge amps are great. I’ve had a few (wish I still had them) and they’re terrific value..
Oh by the way the silverface was actually produced in 67 as well, starting in april. They were same circuit as the previous “Blackfaces” and were produced with a “drip edge” until may of 68, when the circuit was changes. I could be wrong but the Champ circuit never has changed as far as I know until the end of run in 80.
just got a champ silverface ,no tail on the logo , what im not sure about is the grill cloth has NO blue in it , its a silver grey and black , it does not look like its been changed , what up with that ?? I bought mine in ’73 and I still have it. The blue in the cloth is really faded, barely looks blue so that might be the issue with yours. I have recently acquired a Fender Champ, it fits almost all of the information given here. Except my preamp tube is a 12ax7. My speaker code says it’s a 76 model. It’s a silverface with orange black and silver grillcloth that’s factory. The fender logo is tailess. I need the schematic for this amp. The preamp like I said is 12ax7, power amp tube is 6v6, & the rectifier tube is 5y3. Can anyone please help me? 7025 is a premium version of the 12ax7 supposed to be low noise, any 12ax7 will work in this amp. I’ve attempted to download the schematic for this amp, the one I have has a broken volume control and no knob, the unit works perfectly but I’d like to repair the volume control and knob..
Great sound, simple operation, I wished it had a reverb but maybe I’ll build a tube reverb unit to couple with the Champ.. Need the dimensions for this amp to order a vinyl slipcover – mine is in the shop right now being fixed. Specifically, a Champ, not a Vibro Champ. I purchased one Fender Silverface Champ! Good amp! Just I’m a bit disapointed of the bass knob. It dosn’t respond so much. Treb is ok. Does any one made the same experience? Does anyone know if The Vibro Champ has more power or more distortion than a regular Champ?